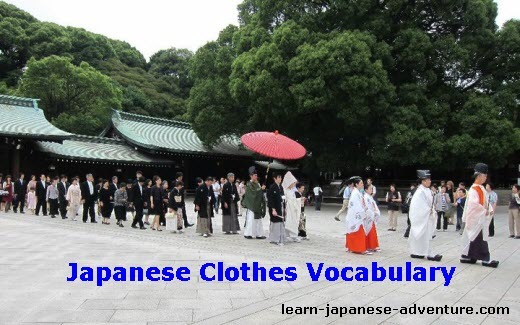 This section covers the words and vocabulary used to describe Japanese clothes and accessories. As most of the words are translated from English or other languages, the Japanese clothes word list consists mainly in katakana. Although Japan is a modern country, Japanese still keep their tradition very well. You still see them wearing traditional clothing in the wedding ceremonies and 祭り (matsuri - festival). If you have a chance to stay in 旅館 (ryokan - Japanese-sytle inn) in Japan, you will also get to wear the 浴衣 (yukata - Japanese Summer Kimono). Let's see what are the Japanese clothes word list in the following. The above are the words used for Japanese clothes and accessories.